Long before she was unforgettable and a woman who knows, Natalie Cole was singing some of the most soulful music around. Not saying that her soulfulness is gone, but she has mellowed like a fine wine. Some critics and fans complain that she should still be hollerin’ like she did back in the day. You can only do that for so long before you sound like you have gravel in your throat instead of a good holla’. I can remember back in 1978 when radio stations featured a whole album late on Wednesday nights. I stayed up late one mid-summer night to tape “Natalie Live” on the radio. I was a mesmerized teenager so to me, she could do not wrong. I even remember watching her first televised hour long special during spring break of that same year. Natalie brought us live versions of her hits of the day including “Sophisticated Lady“, “This Will Be“, “I’ve Got Love On My Mind“, “Inseparable“, and “Our Love.” She displayed her jazz roots on “Lovers” and “Mr. Melody.” She took us to church at the end of “I Can’t Say No” which rolled into a soul stirring “Something’s Got A Hold On Me” and she ended her service with “Be Thankful.” She partied hardy on “Party Lights.” She rocked out on the bluesy “Que Sera, Sera” and The Beatles‘ “Lucy In The Sky With Diamonds.” This album would not have been complete without her “testifying” on “I’m Catching Hell (Living Here Alone).” “Natalie Live” was recorded in August 1977 and March 1978. In between the recordings, Natalie gave birth to her son, Robbie. I knew every word of every song, backward and forward. Years later, I got a copy of the album on vinyl and was overjoyed when it came out on CD. This is not an easy album to find. I recently saw it on eBay for $80.00. Last month, The Right Stuff Records, a division of Capitol Records (“the house that Nat built“) released the “Natalie Cole Anthology” which includes 2 disc’s full of Cole classics from 1975-81. My favorite Natalie Cole song “La Costa” is included but “Beautiful Dreamer” on which Natalie played piano was not included. It, along with “Heaven Is With You“, could have replaced the last few tunes on the 2nd disc which were definitely not some of her best work. Overall, the disc is quite enjoyable and definitely a hollerin’ good time for the classic Cole fans. Enjoy your music! This entry was posted on Friday, May 9th, 2003 at 7:56 am. 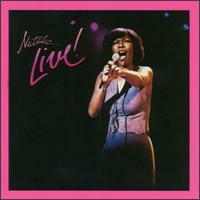 It is filed under Flashback Friday and tagged with Flashback Friday, Natalie Cole, Natalie Live. You can follow any responses to this entry through the RSS 2.0 feed. There’s no wonder we click so well. We have so much in common. La Costa is my favorite by Natalie as well. Although “Unforgetable” duet with her Dad runs a close second. It seems that not only has Natalie has matured, but is so wonderfully happy and secure in her life that it comes across in her music. I can’t wait to hear her next body of work. you told me that this week’s fashback would be great. and it is! thank you.